First install InkyPhat on Raspbian on your pi. Pi Zero W might look amazing doing this if you are only pulling info from other places. For now I am only pulling the data from coinexplorer to show a proof of concept. I got the yellow one, but forgot to get the GPIO header for my pi zero w, so its stuck on the Pi3 for now. IMPORTANT: I had to use this line on the pi zero w and reboot after installing the software. As a test run use this code to show the Denarius Burn Address Balance. print("""Inky pHAT: Denarius displays blockchain information. This is the version I am playing around with to display more than a one liner balance. Line by line breakdown of this so you can abuse any explorer for your favorite cryptocurrency. I just learned basic python about an hour ago, so anyone wants to throw info in here, please do. Sets the address using daddress as the variable. Sets the URL. %s heads on over to stick that daddress variable from above into the complete block explorer API address. This loads the JSON from that URL variable of the complete address. Stores the text D balance= and puts the data from the JSON next to the = sign. This would print the line to the command line. But we want InkyPhat to do its thing so we get the rest of the gobbly gook from the code above. The idea is that if the e-ink takes 20 seconds to refresh, why not pull different stats in every 15 minutes or so running cronjobs. This example I show pulling in JSON data, rounding to get 3 decimal place precision, then multiplying the POW/POS decimals by 100 to get a percentage (probably did this backwards). I am converting floats and strings like this because I have no clue how to one liner and compact each variable. Then I print all one line with line break '\n' between variable and this time I am not centering the text and instead starting from point 5,20, all at a nice font size of 20. Data wise I am thinking this goes on a pi zero w still, so no running the daemon to pull stats from yet. Kind of silly how it works to add an image, but basically follow their own guide how to create this in GIMP. Also be aware the canvas size has to be 212x104 pixels. Make it woooork. Sample GIMP png for testing. Some sample cronjobs and resulting files that can be thrown into this. Any coin daemon can be done in a similar way. Below takes the output and throws into a file every 60 seconds. Then pull want you want from a cronjob and your InkyPhat python file. Example: post fortunastake count every hour, while the fscount.txt file is constantly updating every minute. Now you want to throw Bitcoin Price into your new Cryptocurrency scroller? Pulling API info from coindesk. print("""Inky pHAT: Bitcoin Price information. 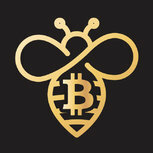 Sample yellow bitcoin logo I am using. One last one pulling stats from coinpaprika API. The idea is I have changed a thing or two each go around. print("""Inky pHAT: Denarius Price information. I edit the logo in GIMP by first resizing the image to 54x54 pixels, then adjust canvas size to 212x104 pixels and drag the logo to where I want it located. Personal Favorite combining all the above into showing the Denarius Logo+Text with Balance and Address below. Since the D is too big, the address cuts off, but no big deal. If you have a fortunastake (masternode), you could scroll some info on yours, or even cycle through all of them if you have more than 1. Just chose a random D addy on this one. To change fonts I will use Denarius official font selection of Open Sans - Semibold. Change to the new font. Looks like the image can't be downloaded from here. Not even sure the image can wget from my github. Here is an example of flipping the screen 180 degrees on the pi zero w.
Now for a block height and total supply screen. Then to combine 2 screens for a cronjob. Seems like an easy way to scroll through different screens.